KANSAS CITY, Mo. (AP) — The Kansas City Chiefs saw their bandwagon empty during a midseason swoon, fans jumping ship almost as quickly as Kareem Hunt hitting a hole or Tyreek Hill speeding to the end zone. The Chargers (7-7) led 13-10 early in the second half, but Rivers threw three interceptions — two of them to Peters — and Austin Ekeler coughed up a fumble down the stretch. Rivers finished with 221 yards passing and a touchdown, but has thrown 13 interceptions during the Chargers’ losing streak to the Chiefs. Melvin Gordon added 78 yards rushing and a score. “We took a step back today,” Lynn said. 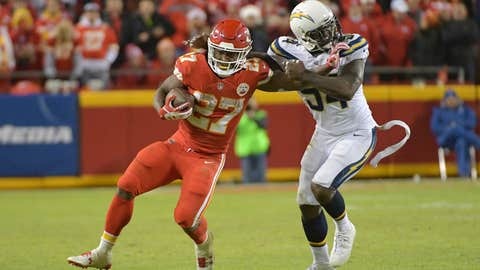 The Chiefs’ defense, which played so salty last week against Oakland, was buoyed by the return of Peters from a one-game disciplinary suspension in helping to build a 10-6 halftime lead. One that didn’t last very long. The Chiefs answered with a methodical, 69-yard scoring drive of their own. Hunt supplied most of the work, and he capped the drive by catching Smith’s short TD toss to give the Chiefs a 17-13 lead. The Chiefs’ challenge failed and Harrison Butker knocked through a field goal for a 20-13 lead. The Chargers’ offense, which had committed just six giveaways over the last nine games, coughed it up again three plays later. Peters helped to pry loose the ball from Ekeler, and Butker tacked on a 51-yard field goal a short while for a comfortable cushion.